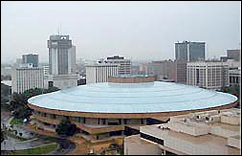 (CelebrityAccess MediaWire) — The city of Wichita is seeking proposals for outside management of its Century II Convention Center, and will be seeing one from Sedgwick County. County officials confirmed that they will prepare a bid to run the convention and performing arts center in downtown Wichita. The county already owns and operates the 12,000-seat Kansas Coliseum and is in the planning stages for a 15,000-seat downtown Wichita arena. The county will decide later whether to close the 10,000-seat Britt Brown arena at the Coliseum complex when the new arena is completed, according to the Wichita Eagle. The Century II has lost at least $450,000 a year for five consecutive years, but the county feels that it could help turn the venue around. The county control would mean that a single agency could work with outside promoters to schedule events at Century II, the downtown arena and the Coliseum, establishing a “one-stop shopping” system for promoters, and eliminate the competition in the area. All three facilities would also unite under the county’s Select-a-Seat ticketing system. The city has asked bidders to consider three options: total privatization, general management and marketing, and general management only. Privatization has received a great deal of criticism from the area’s local arts tenants. “Typically, private companies, when they come in…make their money off the backs of local users,” Wichita Symphony Executive Director Mitch Berman told the paper. He said that local users face not only increased rent, but also having to buy box office and other services they don’t need, which can double or triple the cost of staging a show.